Onset is a leading supplier of data loggers and monitoring solutions used to measure, record, and manage data for improving the environment and preserving the quality of temperature-sensitive products. Our award-winning HOBO® data logger and weather station products are used around the world in a broad range of monitoring applications, from verifying the performance of green buildings and renewable energy systems to agricultural and coastal research. 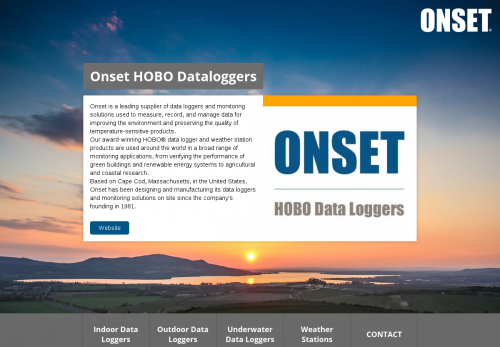 Based on Cape Cod, Massachusetts, in the United States, Onset has been designing and manufacturing its data loggers and monitoring solutions on site since the company's founding in 1981. Energy consultants and facility managers need to actively manage buildings in order to deliver maximum value to all stakeholders – owners, managers, and occupants. Onset’s indoor monitoring solutions can help building professionals gather, track, and analyze the full range of energy and environmental data pertaining to a facility. And more importantly, accurate, reliable data from Onset loggers means it’s possible to make the right decisions – with confidence – so you can reduce costs, save energy, conserve resources, and improve occupant comfort. Environmental science is critical to the health and well-being of our planet, but the work is often challenging. Weather and climatic conditions are constantly changing, inhospitable and remote environments make it difficult to gather and record information, and there may be a need to collect data from multiple locations. Onset’s outdoor monitoring solutions provide tools and software built to deliver the accuracy and reliability that researchers need – so they can gather, track, and analyze the full range of environmental data – accurately and reliably, every time. As the demand for water resources continues to grow, the ability to assess and monitor the effects of climate change, urban development, and agriculture is more important than ever. To meet this demand, ecologists, biologists, hydrologists, and water managers must practically and effectively monitor and evaluate water temperature, level, and quality. Onset’s water monitoring solutions provide research-grade data loggers that are widely recognized as the industry standard for gathering and monitoring water data. With the ability to collect data for months, or even years, at a time, these loggers can withstand a wide range of conditions, offer unparalleled ease-of-use, and deliver exceptional reliability in even the harshest environments. Weather stations measure environmental parameters such as temperature, wind speed & direction, rainfall, soil moisture, and barometric pressure. Weather stations are often deployed in harsh environments, and users rely on them for highly accurate and reliable measurements over long periods of time. Designed to withstand the toughest conditions, Onset’s award-winning weather data loggers provide years of reliable, accurate performance, can be configured with a wide range of plug-and-play Smart Sensors, and are available in web-based and stand-alone USB options.